When Estudiantes de La Plata announced that Marcos Rojo had been training with their squad on Wednesday, there was big coverage in the Argentine media, with some outlets wondering if defender could soon be returning to his old club. As the media was just questioning the possibility, we didn’t even give it much attention. But a story from La Plata newspaper El Dia today totally believes the Manchester United player is going back to his home town club. 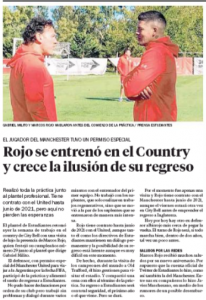 El Dia reports that Rojo didn’t just go through physical work with the reserve squad, but also took part in the most ‘intense’ training session. Manchester United, who gave Rojo special permission to travel to Argentina during the international break, forbid him to speak to the press, which would probably feed the transfer rumours. The player is expected to train with Estudiantes again before returning to England. El Dia says that Rojo is only letting the wish of his return grow, although this is a very difficult operation to be done in the next summer window. The newspaper states that the defender is going back to Estudiantes, but can’t say when. They don’t know if it’s in 2020 or 2021, when his contract with Manchester United expires, but they’re pretty sure he’s returning. Talks between the player and the club are said to be regular, even though, once again, it’s very unlikely for Estudiantes to afford such a signing in the next few months. El Dia were absolutely excellent on the rumour of Juan Foyth moving to Tottenham. Whilst in Europe it was being widely reported he was off to PSG, El Dia insisted it would be Spurs… and where did Foyth move from? Estudiantes, of course.